This is the last installment of the Jamie Oliver series for Zoe’s (Bake for Happy Kids) event – Cook Like a Star. I thought it’d be appropriate to end it with a dessert (all meals aren’t complete without dessert, right?) and the dessert I chose is to an extremely easy, buttery, a perfect snack for breakfast and tea and is also one that I tried back in 2009! Versatile Blog Award from Sam at What Will I Cook Today. Sam is an awesome foodie who makes lots of healthy dishes – one particular dish that I love is her tofu steak: I love tofu, but I’ve never thought of making it into a steak! Oh, and her mini blueberry cream cheese pies: sheesh I’m already drooling just typing the name! I wish I can be like her and cut down on my intake of meat in my daily meals, but I can’t because I love meat *er-hem* quite a lot… Anyway! Thank you so much for the nomination, Sam! I eat non-stop whenever I’m overseas (unless I’m on a tight budget) – my appetite usually doubles whenever I’m overseas! I swear by the phrase, “Never waste your fats on unworthy food”, so when I’m eating sinful and fatty food, I’ll make sure I go for the best and only the best! Congratulations and I hope you all like the award. Share 7 things about yourself and then share the love! And now, on to the step-by-step photos! First measure flour and baking powder in a small bowl. Mix them together. 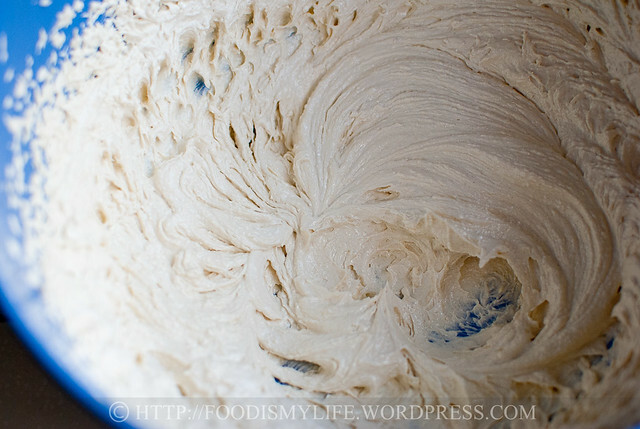 Next measure butter and sugar in a large mixing bowl. I ran out of caster sugar so I used brown sugar instead. Equally yummy! Cream them until light and fluffy. Add in one egg and beat it in. 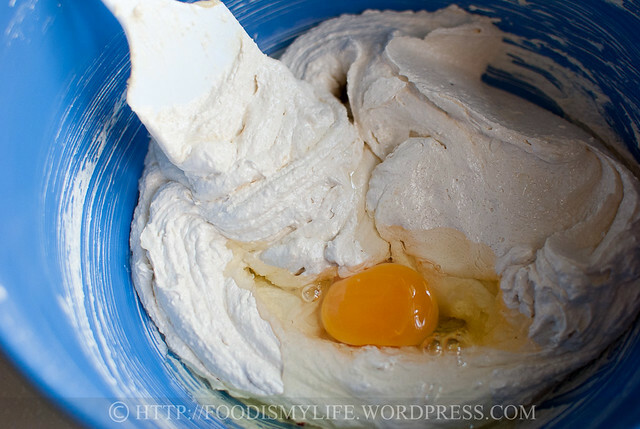 Add in the second egg and some vanilla extract / vanilla paste and beat it in. 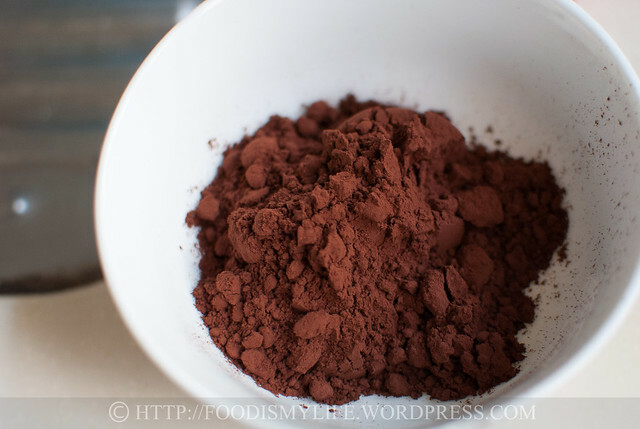 … Add a little hot water to make a cocoa paste. 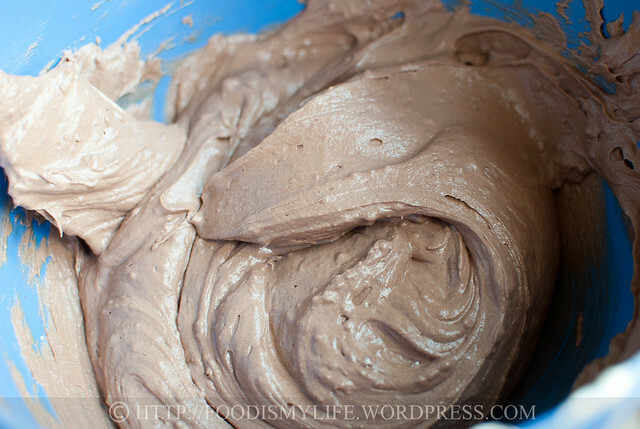 Let it cool slightly and add it into the batter. …and fold until fully incorporated. Add in some chocolate chips if you’re feeling you need more chocolate love. Spread them into a baking tin. Unmould and dust with some icing sugar (to make it pretty!) and serve! To see all other foodies’ Jamie Oliver cooks and bakes, please click the little froggie below! 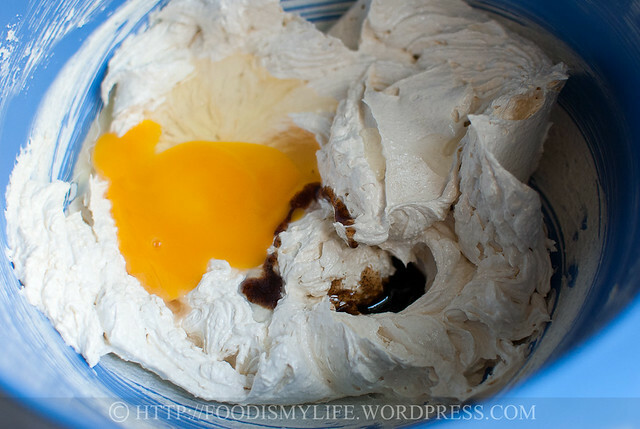 I’m also submitting this to Bizzy’s Recipe Box #7! Preheat the oven to 170 degrees Celsius. Grease and line the bottom of a 8 x 4-inch loaf tin. 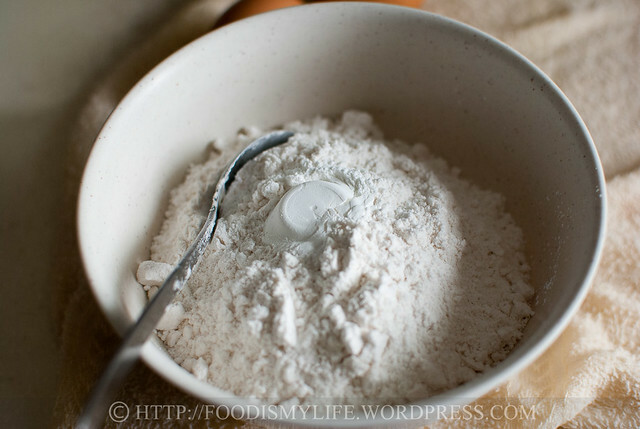 Measure plain flour and baking powder in a small bowl. 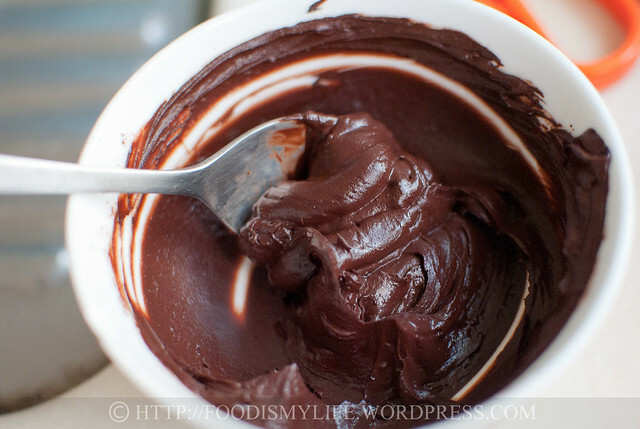 Stir with a fork / spoon / whisk to mix them altogether. Set aside. 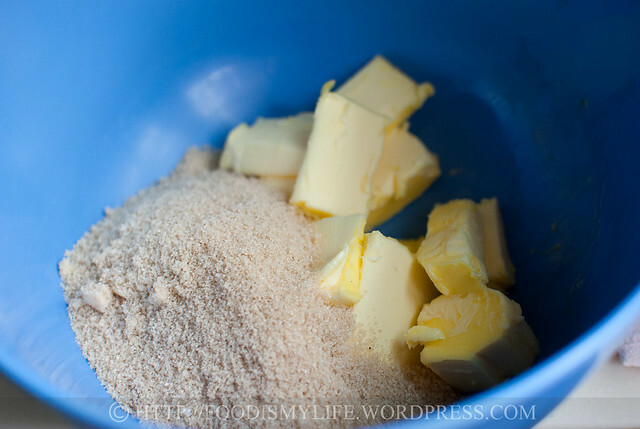 Place the softened butter and sugar in a large mixing bowl. Beat, with an electric mixer, for 5 minutes, scrapping the sides down occasionally. Add in the eggs, one at a time, beating well after each addition. 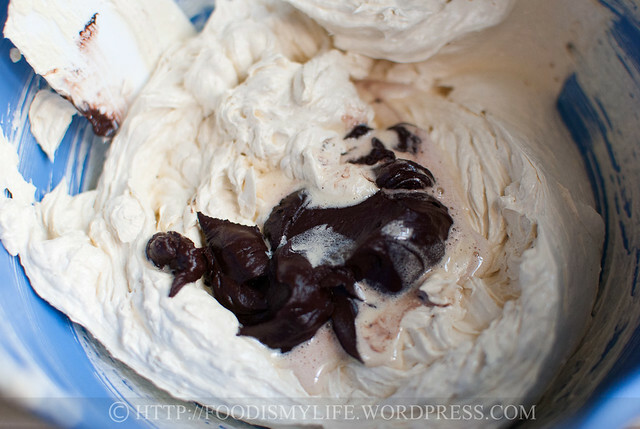 Beat in the vanilla extract, followed by the cocoa paste. 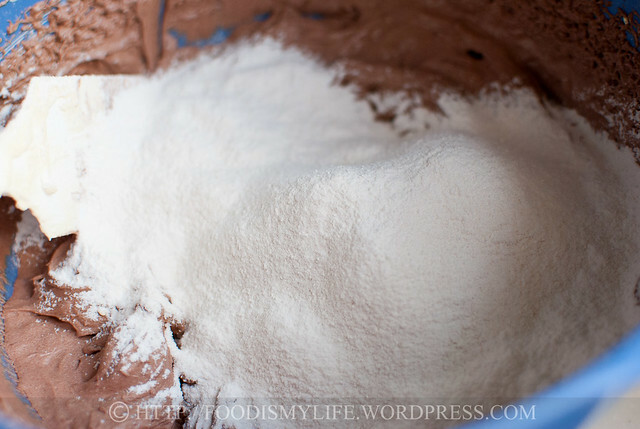 Sift in the flour mixture in two batches and fold the flour in gently. 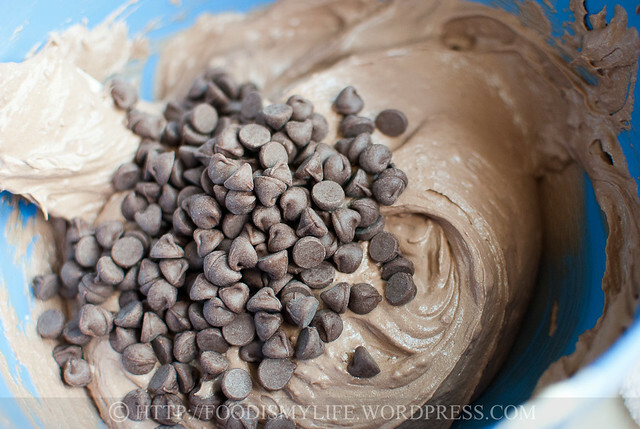 Fold in the chocolate chips if using. Transfer the batter into the loaf tin and bake for 35 - 45 minutes until a skewer inserted into the centre of the loaf comes out clean. Let the cake cool completely in the tin. Turn the cake out and peel off the parchment paper. Turn the cake right side up. Slice and serve! This is a really nice chocolate cake. The first time I made it, I forgot to put in the chocolate chips until the whole mixture was in the tin. So I sprinkled the chocolate chips over the top and lightly folded them in. The result was lots of chocolate chips in the top and on the surface which gave it a lovely crunchy texture on top. I followed the recipe exactly the next time and it was good but I’m definitely going back to the mistake version which has so much more interest. Hi Sarah, I am glad you like the recipe! I love the idea of sprinkling the chocolate chips on top, thank you for your feedback, will try it the next time! 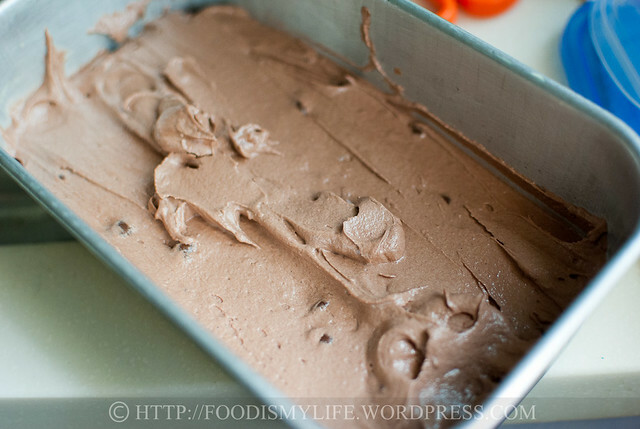 Just having a go at this cake now, got 10 mins left in the oven……smells delicious! And I could never be a vegetarian because of the lure of bacon. And steak. I love chocolate. Thanks for visiting my blog too! Jasline, thanks for the award! 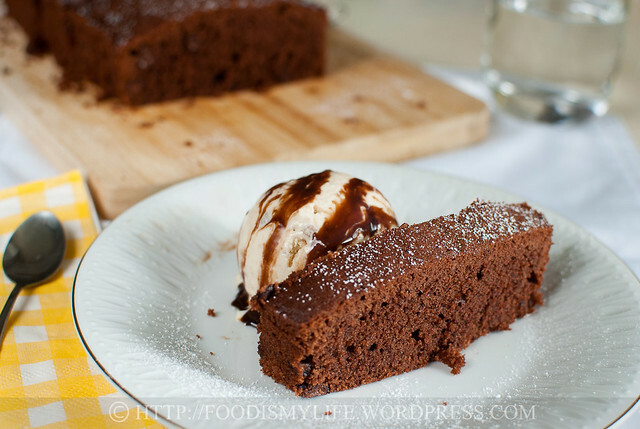 The chocolate cake looks awesome – it looks moist and chocolatey! everyone should have either easy access to a slice of chocolate cake anytime or a good chocolate cake recipe, or both! You’ll never know about vegetables. Strangely, I use to dislike eggplant and bittergourd very much until a couple years ago. Now, eggplant is one of my favourite vegetables (think caponata) and I like a homestyled stir-fried bittergourd with egg. 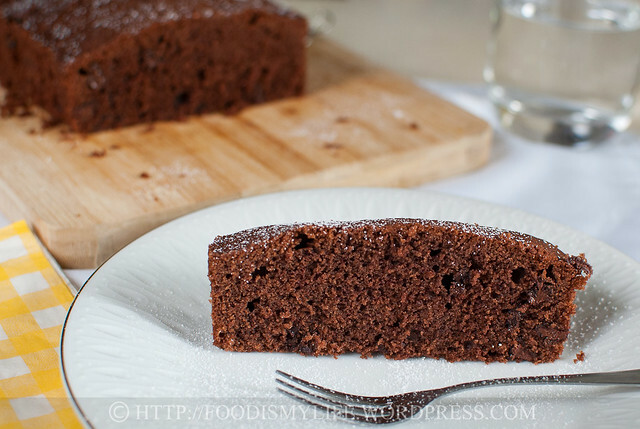 Love this easy chocolate cake, must be really yummy! To me, this chocolate cake seems to be a great classic. No wonder you are baking it again. good morning jasline,congrats on the award and thanks so much for thinking of me and sharing the award with me! I’m truly honoured! Yeah, whenever i go for holiday, i will look for food first, then look around for supermarkets and chk out their food produce, ingredients..all food related! yes, yes..appetite will double, come back dared not step on the weighing scale! haha! Have a good day and thanks again! Thanks for the award too 🙂 I love chocolate cake recipes so I’m definitely trying this one out soon! What a tasty looking cake! I’ll have to try it! And, thank you for passing on the award. I’m honored! The cake looks fabulous! And you’re absolutely right – no meal is complete without dessert! Even breakfast and mid-afternoon snacks… 😉 Congrats on the award – your blog is awesome. 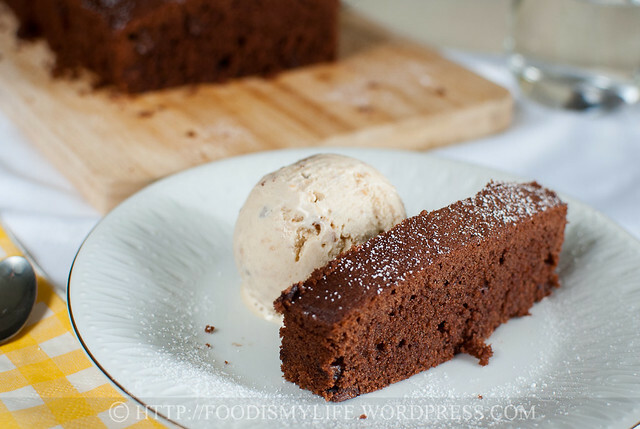 A slice of a lovely buttery chocolate cake and a single scoop of ice cream. Perfection. Congratulations on your award! And thank you so much for passing it on to me! I really appreciate your sweet and lovely thoughts! 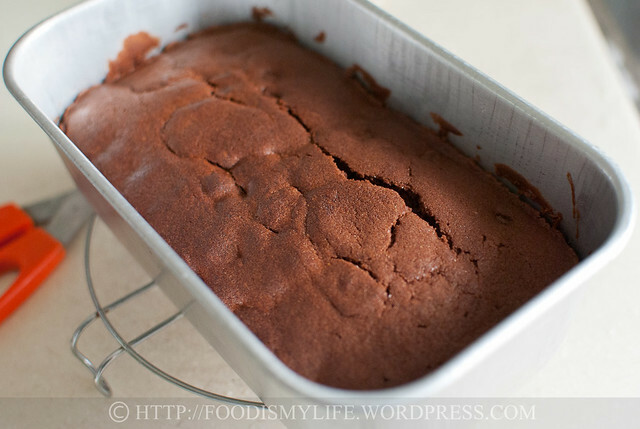 The choc cake looks really moist and delicious! And so yummy with that scoop of ice cream and choc sauce! Thank you once again, Jasline! thanks for your nomination ya…it is really a great thing to know more about you Jas. This looks very delicious, Jasline! Congratulations on the award! Congratulations on your award and thanks for sharing it with me. I am honored to receive it. I will pass it on, as soon as possible. What fun! Great post. Love the decadent looking loaf. Congrats on your award! You know how much I love Jamie’s recipes and you are so right, a great dessert must follow a great meal. 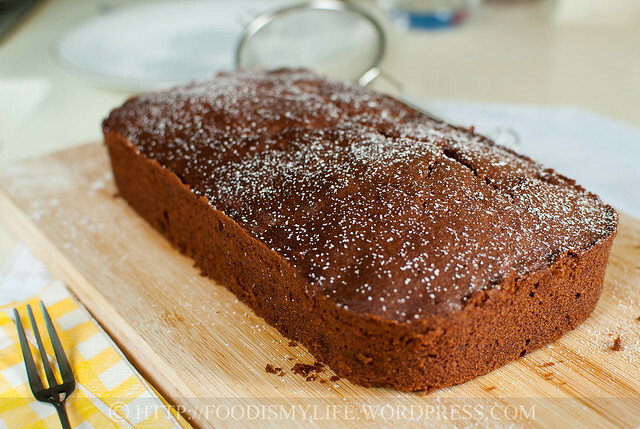 Love the simplicity of this cake, looks tender and moist and I know it tastes incredible. Thank you for the award nom!! !